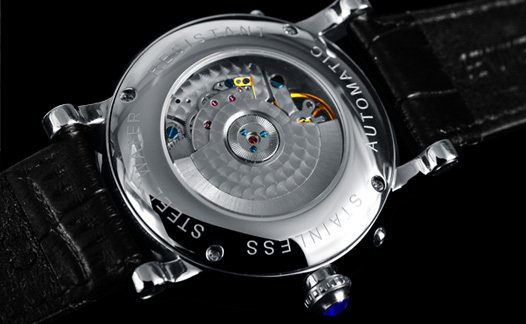 For mechanical watches, the creativity and quality are the eternal theme. 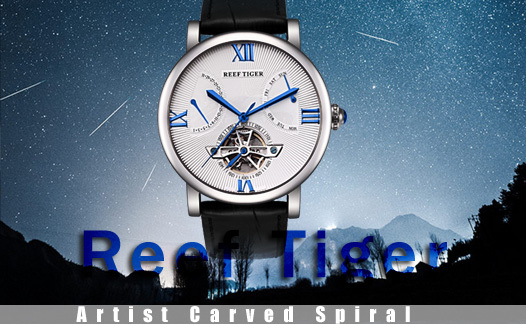 Reef Tiger Artist Carved Spiral watch uses RT6502 tourbillon movement, to create stunning beauty of the craft on the dial, it is a tribute to the watch-making tradition and spirit. Different from the traditional design, Carved Spiral watch only uses XII, III, IV, XI four Roman numbers as hour markers. The textured large Roman hour markers and Guilloche decoration interprete simple and delicate art style. The folating tourbillon at 6 beats like the operation of small second hand, which bears the time mystery which only rational and emotional people can read. Date and week are displayed on the subdial on the left and right of the dial, which forms balance with the tourbillon device on the bottom of the dial, the whole dial layout is so elegant and generous. The arched sapphire crsytal on the crown echoes with the hands. Like the refined jewelry, adds noble temperament to the watch. 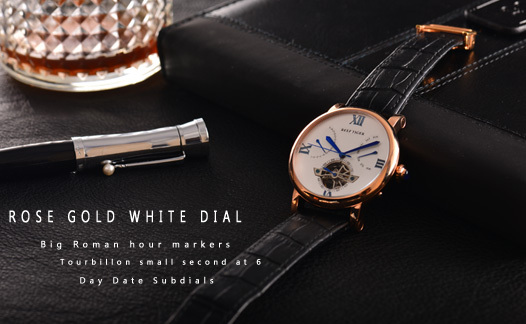 Carved Spiral watch uses blue steel, rose gold and stainless steel hands to fit for different dial and case, knurled cutting hands bring more dazzling visual feeling, which further enhances the gorgenousness of the watch. The watch uses RT6502 movement, it is tested by professional technicians of Reef Tiger, its daily error is controled within 5 seconds. Perfectly chamfered bridges, polished edges and gears, each detail passes fine craftsmanship.